Logan • A radio call of Wednesday’s Utah State-Air Force game would likely have included several superlatives about the Aggies backcourt of sophomores Sam Merrill and Koby McEwen. Merrill canning a 3-pointer to start the second half, for instance, and McEwen throwing up a blind reverse layup that was good. Merrill stepping into the paint and swatting away an Air Force shot. McEwen making a shot and slide-diving into the cheerleading section. Using his foot to thwart another Falcons’ opportunity, Merrill then kicked a pass 10 rows up into the Dee Glen Smith Spectrum crowd. 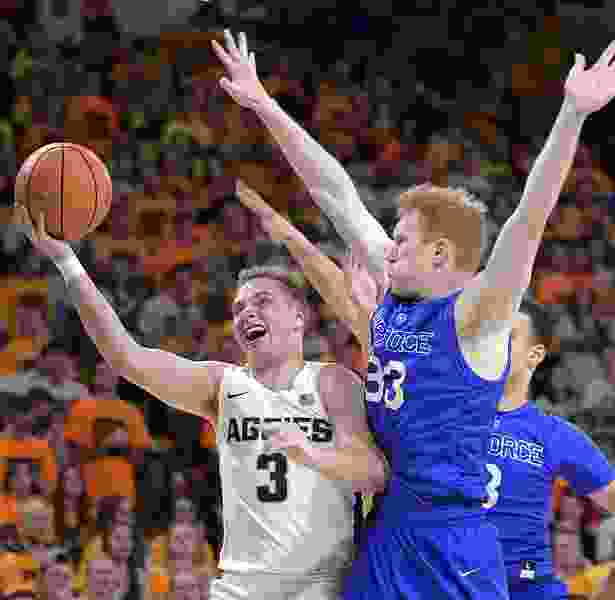 Everything, except maybe that last one, was just the kind of script Utah State needed to execute as the Aggies stopped a four-game losing streak with a 71-49 win over Air Force in a Mountain West conference game. Merrill finished with 21 points on 8-of-10 shooting — including 5 of 7 from beyond the 3-point arc. The sophomore from Bountiful hit a pair of shots in the first half and had five points at intermission. Utah State (11-11, 4-5) led 29-25 at the break and went straight to Merrill to start the second. Although the Falcons did come back with a pair of field goals, Merrill opportunistically popped a long 3 when his defender slipped to the court - the beginning of a 10-0 run that included a trey from McEwen in the corner and McEwen’s off-balance blind layup with went through the hoop with out rim or backboard contact. “You know you always have to take backdoor layups away from them, but you also have to take away rhythm 3s,” Duryea said. Air Force was led by Ryan Swan’s 10 points, but he was the only Falcon in double figures. The game marked the return, in a limited role, of senior center Alex Dargenton. In a season marked by injuries to both ankles, Dargenton was cleared to get back on the court and he scored three points in nine minutes of action. His last time on the floor was against Boise State, but Dargenton injured his ankle 20 seconds into the contest on Jan. 17. • Sam Merrill connects on eight of his 10 shots, including five 3-pointers, and led Utah State with 21 points. * The Aggies, breaking a four-game losing streak, also get double-digit scoring from Koby McEwen (20 points) and Quinn Taylor (13). * It is Air Force’s first game in a week as the Falcons had to cancel Saturday’s game against Fresno State due to the government shutdown.